There are several types of bees that make honey to some extent, but those actually known as honeybees, and more specifically European honeybees, belong to the species apis mellifera. Common honeybees that are available for purchase to set up a hive, including Italian, Buckfast, All-American, Russian, Carniolan, etc., are all sub-species' of apis mellifera, which we will discuss in detail here. Most of the following information has been compiled from Beekeeping For All, a book by Emile Warré. 1. A single, fully developed female capable of laying enough eggs to assure the maintenance and growth of the colony. This is the mother, inappropriately called the "queen" as she does not rule the colony. 3. 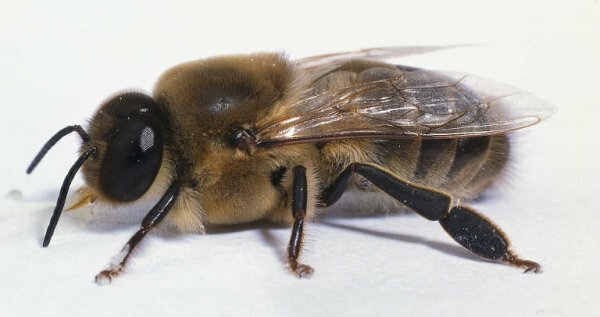 Some males, or "drones", who only normally appear at the start of the swarming season and disappear when or shortly after the nectar flow (often referred to as "honey flow") ceases. Their number varies from a few hundred to several thousand, and largely depends on the exact sub-species of bee as well as other factors. People were once taught that bee colonies were ruled by a king. Today we know that in each colony there is no king; but a queen, or better yet, a mother. This mother is a fully developed female, mated and capable of assuring the future of her family through her egg laying. The overall ruler of the colony is the common interest, rather than the mother. We shall, however, conform to common usage by referring to the colony's mother as the "queen". The queen's appearance makes her easy to recognize. She is fatter and much longer than a worker. Her abdomen is usually of a lighter shade and extends well beyond her wings. Her stature is more stately. She is distinguished equally from the male by her more slender body. The male has a much more rounded (barrel shaped) and hairier abdomen and his wings extend passed it. There is normally only one queen in a colony but on occasion one may find two queens in a colony. Some beekeepers report having seen three. These exceptions happen for several reasons. A queen that is too old does not have sufficient energy to go and kill her daughter at birth, as earlier in her life her instinct would have driven her to do. Sometimes, the beekeeper has introduced several queens in succession to a colony he or she believed to be queenless. The queens have been kept separate, pushed by the bees in opposite directions, and they have formed different groups which each have the elements of a colony. This state disappears as soon as the groups become closer together, be it through the growth of the groups, or through the arrival of cold weather. Sometimes this condition leads to swarming. Queen bees are nothing more than worker bees that are fed a substance called "royal jelly" during the entire period that they are larvae. This constant feeding of royal jelly causes the worker larva to fully develop into a larger, sexually developed bee. It is in this way that a honey bee colony can create a new queen bee when they need to. It takes only 16 days for a fertilized egg to develop into a fully mature, emerged queen. When two queens meet, they typically attack one another. The strongest or the most able pierces the abdomen of the weaker one with its sting. Death is the result. Sometimes two queens sting and kill each other. This hostility exists between all mated queens, virgins, or even queens still enclosed in their cell. When the bees raise queens for whatever reason, they make up to a dozen queen cells. The queen that first emerges hurries to find the cells from which her sisters are preparing to emerge and pierces them with her sting. Observe here a means of rigorous selection given by nature to the bee. Only one queen is saved out of a dozen. As this queen is the one who was the first to lift the cover of her cell; she must be the most vigorous. for the queen, the bees, in their excessive excitement, press themselves around the queen as hard as they can; squeezing, and sometimes, suffocating her. At other times this is caused by hostility and is accompanied by stings from which a rapid death follows. This happens to old, infertile queens shortly after the hatching of their successor, to queens that the beekeeper has held for too long (thus changing the particular scent that enables the workers to recognize her), and to unfortunate young queens who, upon returning from mating, enter a foreign hive that is too near their own. A colony deprived of its queen is described as queenless. If the queen disappears and is not replaced by the beekeeper or by the bees, the population of the colony diminishes rapidly until it disappears. Drone and young queen bee mating in flight. Her presence is necessary because only the queen lays the eggs destined for perpetuating the colony. Nature too, has taken all possible measures to keep her alive. The queen is mated in the air during flight. The queen does this only once in her life, mating with up to fifteen drones. She stores enough sperm to last her entire life (up to five years) and subsequently, never leaves her home again unless in the midst of a swarm that is leaving to start a new colony. A queen lives from four to five years. This is about 50 times longer than the life span of workers born at the beginning of the nectar flow. As with chickens, it is in the second year that she lays most prolifically. It is quite easy to distinguish old from young queens. Young queens in their first or second year have a larger abdomen because it is distended with eggs, their wings are intact, their head and body are covered with hairs and their movements are agile. Old queens of three years or more are smooth, their wings are damaged and their movement is slow. It is a mistake to believe that the queen directs the construction of the combs and delegates the work to the workers. The role of the queen is just to lay eggs. It is nonetheless true that the presence of the queen is indispensable to the activity of the colony. The importance of the role of the queen and the seriousness of her loss is easily seen when a hive becomes queenless. The workers become agitated, roused, running in all directions in search of the queen. They work less and become bad tempered. The situation gets still worse if there are no eggs or young brood in the hive to allow for raising a new queen. Furthermore, in a colony that is dying of hunger it is the queen who survives the longest, not only because the queen is stronger and more robust, but also because the bees save for her the last mouthful of honey. The queen does not possess wax secreting glands nor the equipment for gathering pollen or nectar. The queen does not even know how to feed herself. If she is enclosed alone in a box with some honey within reach she will die of hunger beside the honey. It seems to be the same in the hive. While she is laying, the workers supply the queen with brood food (a mixture of honey and pollen already modified by an initial digestion) and when she is not laying, pure honey. However, it is not the worker that passes the food into the mouth of her mother, because the discharge of the food is only possible with the tongue retracted. On the contrary, it is the queen who introduces her tongue into the mouth of the worker to take the food that is prepared for her. The queen is often shy and timid. The slightest unusual noise may frighten her. She often hides herself in the recesses of the hive where one might crush her, or at least have difficulty finding her. The queen does not even use her sting except against other queens. Even without having seen her, one can be certain that the queen is in a nest if the worker bees are coming and going normally, with many bringing pollen as they return (pollen is brought into the hive more frequently during the morning hours). The queen has a strong scent which is caused by a pheromone that she releases. This scent assures the entire colony that she is present. You have already learned that when a queen mates, she is able to store enough sperm in her body to last her entire life. This fact is in itself amazing, especially considering that she may lay upwards of 2 million eggs during her lifetime. What is perhaps even more amazing, is that the queen is able to decide whether or not to fertilize an egg before she lays it. Only fertilized eggs can become worker bees or queens (females). 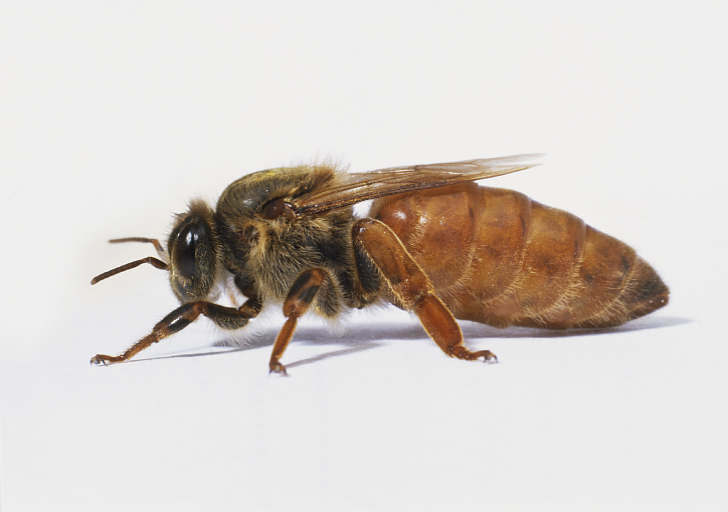 When the queen lays an unfertilized egg, a male bee or "drone" is the result. The workers perform the tasks of construction and maintenance of the comb and the jobs of feeding. They raise the brood, guard the hive as well as clean and ventilate it, forage for pollen and nectar, etc.. There is no way of distinguishing the workers except by the functions they perform. All the workers are destined to perform all the useful tasks of the colony without distinction, according to the seasons, the time and the circumstances. Only the young workers are exclusively occupied with the work inside the hive, as their bodies are not sufficiently developed to withstand inclement weather. It has been said that workers go out at any time of day in spring, only in the morning in summer, and never when it is raining or cold. It is more correct to say that the workers go out whenever they have some chance of finding nectar, pollen or propolis. But the rain so greatly weighs down the worker that it prevents her flying, and below about 50 deg F, bees becomes sluggish. In summer, workers look for nectar first and foremost, but the midday sun dries up the flowers. In spring it is, above all, pollen that the workers forage for and neither heat nor cold completely halts its production. A bee weighs about one tenth of a gram. She can bring back half her weight (.05 g), though she often brings back only 0.02 g. At that rate, in order to bring in a kilogram (2.2 lb.) of nectar, it is necessary for 50,000 bees to make one trip. 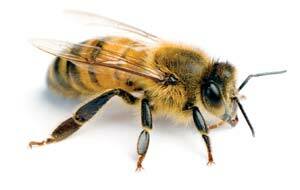 A bee can make twenty one-kilometer round-trips per day, bringing in a total of 0.4 g nectar. Thus, the harvest of 1 kg of honey represents travel of more than 40,000 kilometers; roughly the circumference of the Earth. Workers can live a maximum of one year following queenlessness or a bad season, i.e. when workers have little activity. In normal colonies during a good season, as a result of their incessant activity, workers live a maximum of two or three months, and often as little as only three or four weeks. The males are generally called "drones" on account of their noise in flight, louder than a bumble-bee and quite different. You will learn to easily recognize the sound of drones in flight. Drones are generally darker than the workers. The extremities of their bodies are hairier and their legs are without the apparatus for collecting pollen. They are easily recognized not only by the size and shape of their bodies, but also by the enormity of their eyes. Their eyes are so large that they appear to make up their entire head. They also have no stinger, so although they may appear and sound threatening, they are actually harmless. During swarm season the drones emit a stronger than normal scent. This is so the virgin queen can recognize them by a means other than their noise in flight. Moreover, this strong scent may allow swarms to be predicted. The drones are gentle and peaceful, although they are curious and have a tendency to be annoying to humans. In the hive they seem to always be asleep. They only go out around midday and only during fine, warm weather, to meet with other drones in "congregation areas" (virgin queens seek out these areas when looking to mate). They sometimes move from one hive to another without any of the workers getting angry with them. Unfortunately, this may lead to the transmission of pests or diseases from hive to hive. In strong colonies, there can be up to three thousand drones. The presence of what appears to be excessive drones in a colony could be a sign of trouble, such as laying workers or an infertile (drone laying) queen. All agree that the principle function of drones is to fertilize virgin queens and some believe that the they are also useful in maintaining the heat necessary to care for brood at any given time. In temperate climates the drones live only a few months. They appear at the beginning of the nectar flow. They are thrown out of the hive or killed (and then thrown out) by the workers soon after it ends. They may be retained indefinitely by a queenless colony. The presence of plenty of drones during the nectar flow seems to indicate that the colony is strong and will give a good harvest if the circumstances are favorable. On the other hand, the presence of drones long after the nectar flow has ended may indicate that the colony is in a poor state; that it is queenless or has only an exhausted queen.